Now, normally I wouldn’t say anything but this is to be noted. On November 9, 2010 I was leisurely riding the MTA bus (public transportation) and the bus did its normal stop at the intersection of Manchester & Crenshaw in Inglewood, CA. 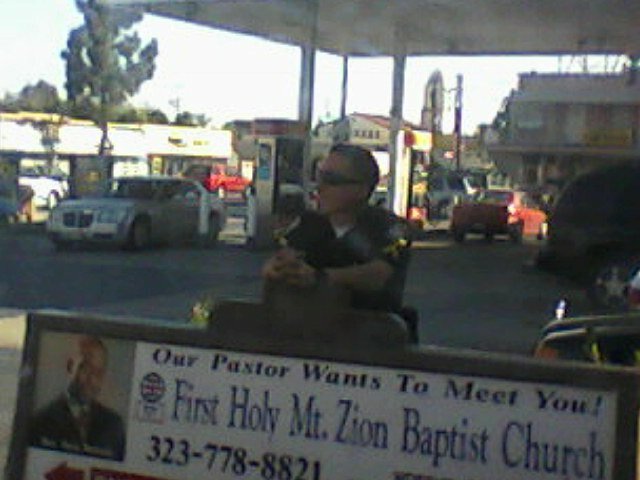 As we sat at the bus stop at that location an Inglewood Police Officer happened to board the bus as we sat there. At first I wasn’t alarmed until I happened to look at the face of this man. IT WAS INGLEWOOD OFFICER ALVARO RUIZ #884! Now let me explain to you real quick who Officer Ruiz is. Officer Ruiz is one of the 5 male officers who helped assist in my battery on the night of April 6, 2007. He is one of the 2 officers who claims he was holding down my upper back, trying to prevent me from standing up. What was crazy about seeing him on this particular day was the fact I had ALL my legal documents with his name written on them in my possession, making my whole body go into a state of shock upon the realization of who he was. It had only been 2 months since I had to actually see him face to face, which was when he came to Part One of my Los Angeles Police Department (LAPD) appeal as a witness, September 15th, to lie on me in hopes of making sure my employment with them is not reinstated. However, what’s ironic is that when my Criminal Attorney subpoenaed Officer Ruiz in January of this year to testify at my trial, he showed up and informed her that he DID NOT recall what happened on April 6, 2007 therefore he could not really testify to it. But fast forward 8 month, Ruiz all of a sudden gets hit in the head with the MEMORY BUG. He was at my LAPD appeal giving descriptive details about April 6, 2007 in direct contradiction with what he had stated earlier this year. You’d be amazed to know this man was able to bring back his whole lapse of memory on this one particular day. I found that to be extremely odd but given the fact I have witnessed police officers lie repeatedly under oath, nothing is a big shocker anymore. This is what they seem trained to do! So instead of just sitting there once the bus got moving again, I approached the bus driver to ask him what Ruiz said to him. (Paranoia at its best) He informed me Officer Ruiz asked him if there were any trouble makers on the bus, he told him no, & that’s when he exited. That seemed mighty fishy to me & that is why I had to write about it just so you all would know what’s going on in my world. The Fight for Justice must go on; I just gotta keep My Eyes Open!! !